Construction company TweWe-Bau put a Sennebogen 673 telescopic boom crawler crane to work on the development of a new slipway in Neuharlingersiel, Germany. During the first stages of construction, the crawler was used to place 21 metre long sheet pile sections prior to them being driven into the ground at a later stage. 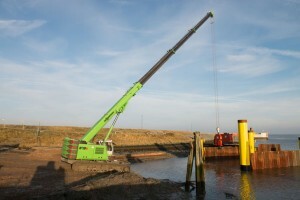 Challenges for the crane include operating in up to one metre of water and working in a tidal environment. The crane was leased from service and sales partner Tecklenborg Baumaschine. Capacity is 70 tonnes and its full-power boom is 36 m long. The wide-gauge crawler undercarriage allows it work in the water, the manufacturer said. Power comes from a 168 kW emissions level 4 diesel engine.